I'm also sorry to hear about your brother. Annie where in Netherton did you loose your Nephew? I remember a young boy loosing his life on the Aintree Station railway lines. I seem to remember a young lad who drowned in canal late 50s early 60s by coffee house bridge. I apologise if I have caused any distress to anyone. Last edited by fatboyjoe90 on Tue Sep 02, 2014 9:50 pm, edited 1 time in total. 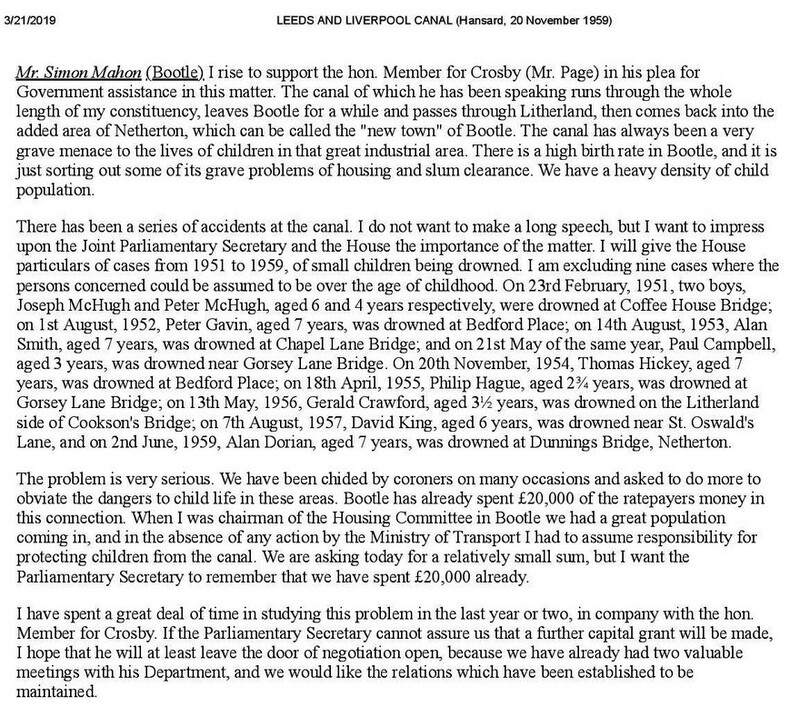 My uncle Leonard lawson and his friend Charlie Geddes sadly died in the canal by The old sausage works! Len was 7 not sure about poor Charlie's age! fatboyjoe90 wrote: I seem to remember a young lad who drowned in canal late 50s early 60s by coffee house bridge I think his name Charlie Lamb. Joe, there was a Charlie Lamb who was a pupil at St Winefrides, he was 2 years older than me and as far as i can remember he completed his schooling at St Winefrides, (he was in my brothers class), so i don't think it was him. The only other person with the surname Lamb was Barney Lamb from Pleasant Street and it definitely was not him. JJC. john Charlie still lives on the irlam estate see him in the strand a lot and always let on to him.john. born bank rd off strand rd. John and John reading your posts I’ve got this wrong somehow with the name, from what I remember some lad (who I thought was) jumped into the canal after he nicked some slummy from packman’s scrap yard. The police were chasseing him and dived into the cut and drowned. Genuine mistake Joe, i have sent you a pm with the lads name, JJC. Thanks for putting me straight on this matter John, and thanks for your pm. sound paul.how are you these days my second home is the hospital.john. Thanks John, I’m just plodding on as you do I haven’t seen you for a couple of years, I hope it’s nothing too Serious with you having to go to Fazakerley. Do you still see any of the lads from the salt box these days? yes paul its still my local and they are all doin well but its not the same anymore does not get packed now;and its been closed twice in the last 8 months.and yes I am at the hospital on Friday having the camera down and I am on cemo tablets daily you just have to get on with it paul.anway you take care.john. Sorry to hear about John, Keep in touch and let me know how you are getting on. John I don't know if heard about the the death of Barny Lamb some years back he was killed in a fight over drugs I believe,it happened in Bideford in Devon, and not long before the passing of my brother Lawrence( 2 years ago )his sister Patsy passed away in Barnstaple hospital , anyway John hope all is well with you i'm still over here in Northern Thailand it's tough going but someone has to do it regards Joe Cunny. Alfie, i have sent you a private message, let me know if you opened it, thank you JJC. Yes Joe i was aware of all that you say, when you think of it Devon became the final resting place for quite a few people from Bootle, hope you are well Joe, JJC. Hi Babs, was so sad about ur brother! i was there the day of the drowning, we lived in 3 Back Garden Lane, my brother John was with them at the time he was 9yrs, we were always on the canal as it was next to the prefab! i"ll always remember that day, they made a raft, the wáter had an under current & all the rubbish in the canal,my dad Leonard was walking up & down the canal! my brother John had a blue jumper on like Victor, my dad thought it was John. I was living with my Gran from the age of 7yrs, but always went to see mum & dad, I was 11yrs at the time!! it was dangerous But we don"t think when were Young. So Sad for ur parents at that momento. Live Life To The Full, Enjoy every minute. Hi Babs, I remember your family though we had moved away from the area before your brothers tragic accident, I wasn't aware of your loss until I read your post. It brought back memories of my own brother John falling into the canal between Stanley and Litherland Road bridges, that was in August 1954 and he was rescued by a lad called George Griff who received a certificate from the Liverpool Shipwreck and Humane Society, our family will be eternally grateful to George, so sad to hear about Victor, take care. So sad for all victims and family's of drowning accident's, especially as it alway's seems to be young innocent children at play. I can remember a little boy from "Pope Street" losing his life in the "Litherland" part of the canal, I knew his elder sister, she and the family were absolutely devastated, the whole community was in shock, I could be mistaken, but I'm sure it was the same little boy named "Leonard" who was spoken of earlier, think it was around the early sixties, apologies if I'm wrong, and my very sincere sympathies to you, a tragic loss such as this must be truly heartbreaking!! Shelagh wrote: So sad for all victims and family's of drowning accident's, especially as it alway's seems to be young innocent children at play. I can remember a little boy from "Pope Street" losing his life in the "Litherland" part of the canal, I knew his elder sister, she and the family were absolutely devastated, the whole community was in shock, I could be mistaken, but I'm sure it was the same little boy named "Leonard" who was spoken of earlier, think it was around the early sixties, apologies if I'm wrong, and my very sincere sympathies to you, a tragic loss such as this must be truly heartbreaking!! Hello mark, yes, (can still remember the tragedy) very sad time for your family!! Last edited by Shelagh on Fri Mar 22, 2019 1:29 am, edited 1 time in total. Last edited by Shelagh on Fri Mar 22, 2019 1:31 am, edited 2 times in total. As a young child I lived in Prior Street and played with Len and Charlie and another boy called Shaun. Shortly after we moved away to Crosby I remember my mother telling me about it. I have often thought about them over the years and think what a tragic waste. Hi Babs, I went to school with him and I've posted a pic including him from Christ Church School. Did not know him very well I always got him confused with Les Chadwick, they where always together and looked so alike! It was a very sad what happened to him. Speech given by Simon Mahon in the House of Commons in 1959. So sad , Dan, all those very young children. I can't understand how some of them got into the position to drown. I suppose I am naive.